Good weather brings homeowners outside to enjoy decks, patios, and porches, but with the summer season comes the introduction of mold growing on vinyl siding. Sometimes it’s stubborn stains from topsoil, rust, dirt, and other debris that leave your vinyl siding less than desirable to look at. No homeowner wants to be distracted from enjoying the backyards of their homes by green tinted mold covering the vinyl siding. Fortunately, there are plenty of vinyl siding cleaners to help kill the mold and restore the siding back to its original beauty. Whether you use a mainstream product available at your local hardware store or supermarket, or if you choose to make your own concoction with bleach, vinegar, or cleaning substitute, the task of cleaning vinyl siding can be quick and easy with the right tools for the job. White vinegar is the secret staple to many household-cleaning tricks. Add in some white vinegar as a pseudo detergent and you’ve got yourself clean clothes. Leave a bowl of white vinegar out in a room and you’ve rid yourself of that hard to shake mothball smell. Why does white vinegar act as all-purpose cleaner? White vinegar’s acidity cuts through grime and dissolves residue buildups with ease, making it an excellent tool for cleaning siding. According to the Vinyl Siding Institute, by using a solution of 30% vinegar and 70% water, you can restore vinyl siding back to its mold-free state. The vinegar, diluted by water, cuts through the grime and residue, but is safer than using bleach. Vinegar is also a more biodegradable and environmentally friendly option. When mold is involved, sometimes household products like white vinegar aren’t powerful enough. With the aid of bleach, this concoction is able to kill mold spores and prevent new growth from developing. If you do plan on involving bleach in your cleaning process, take note of surrounding landscaping and try to avoid the bleach solution from coming into contact with delicate plants and flowers. As a homeowner, you’ve likely heard of the brand Simple Green, a product that aims to produce exceedingly clean and effective results without the use of harsh or harmful chemicals. The good news is that Simple Green also has a house and siding cleaner that is non-toxic, non-acidic, and free of bleach and phosphates. You can also use Simple Green with a pressure washer, adding the solution directly into your pressure-washing tank. Simple Green is great to use when new or sensitive landscaping is a factor when cleaning your vinyl siding. For those wanting to protect plants, animals, and perennials, but are after sparkling clean vinyl siding, a non-bleach solution is usually the best and most low-risk route. Other factors aside from mold may be the cause of unclean vinyl siding, like dirt, grime, or stains from wear and tear. For these issues, Fantastik can aid in the restoration of your vinyl siding. Recommended by the Vinyl Siding Institute, Fantastik is a cleaning product known to have powerful results from showers, toilets, to floors, and even vinyl siding. This all-purpose cleaner was born to target mold, mildew, and other hard-to-clean stains. Fantastik should be sprayed 6-8 inches away from the desired, dirty surface and given a few minutes for the foam solution to penetrate mildew and mold stains. Wipe Fantastik off by using a wet cloth or sponge, rinsing the siding thoroughly with water. The best part of Fantastik is that this product can be used inside your home, too. If you don’t have kids, bubblegum on your vinyl siding may seem like a rare occurrence. However, this happens more often than not, so much so that the Vinyl Siding Institute has a specific formula listed on their official site to rid your siding of the sticky mess that is bubblegum. You’ve probably spotted Murphy Oil Soap in your parent’s garage or home, or even at superstores like Walmart. Murphy Oil Soap is one of the most popular products for cleaning purposes, and for good reason, it’s extremely effective. 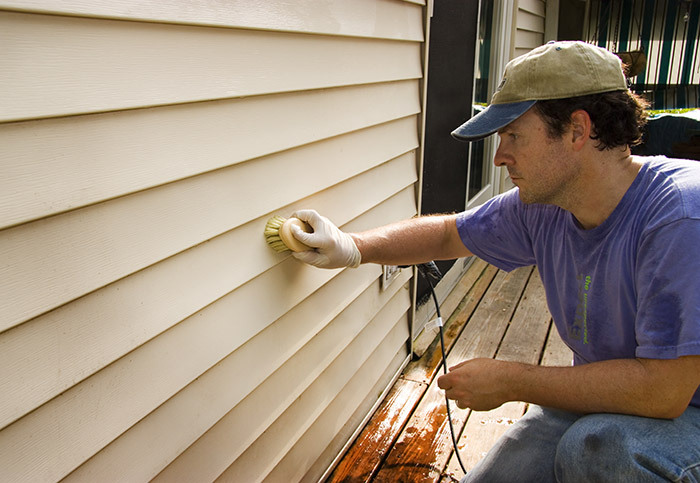 For vinyl siding concerns, use Murphy Oil Soap for bubblegum, but also equip this product for stains comprised of topsoil, rust, motor oil, or grass. While specific cleaners like Fantastik and Murphy Oil Soap can do this job of bubblegum removal, if you don’t have these cleaners around the house you can always try the common solution of 30% white vinegar and 70% water. Does the idea of taking a brush to your vinyl siding make you cringe? While soft bristled brushes are safe to use to scrub away mildew, mold, and stains, some homeowners just want to avoid scrubbing all together. Zinsser JOMAX kills mildew and mold right at application, and the best part is there’s no scrubbing to get your desired results. JOMAX cuts through the most caked on dirt and grime and is perfect to prep the outside of your house for warmer summer months. Homeowners should make it a point to clean their vinyl siding at least twice a year, or at least once before the warmer months hit. Using these products or making your own at home makes this chore much easier, and limiting you from doing it every three months because strong bleaching products will help kill mold growth from reoccurring. Remember to keep in mind that if you’re using a power washer to get the job done, have a family member or friend spot you from the ground. Whatever the case may be for your vinyl siding, there’s a solution designed to treat the stain in question. Even for the toughest of siding stains, the right mixture can get the job done by any novice do-it-yourself homeowner. 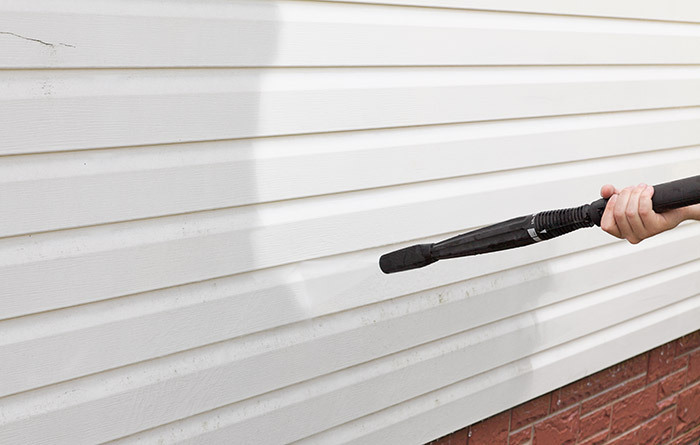 From bubblegum to motor oil stains, nothing is considered permanent when using a strong vinyl siding cleaner. So if you spot one stain or even a whole side of discoloration, don’t jump to the conclusion that you’ll have to replace your siding just yet. A simple spray down and rinse could effectively do the trick. On the other hand, if your siding is past its prime and needs an upgrade, Feldco has you covered with the best vinyl siding replacement around. Our siding is beautiful, durable and will no doubt transform your home. Get a free quote online to start your siding replacement project with Feldco.